ABU DHABI: Sri Lanka, who won the toss and batted, reached 227-4 at stumps on the opening day of the first Test against Pakistan in Abu Dhabi on Thursday. Opener Dimuth Karunaratne was the top scorer with 93 and added 100 for the fourth wicket with skipper Dinesh Chandimal (60) to lift their team from a precarious 61-3 at lunch. Niroshan Dickwella was unbeaten on 42. Leg-spinner Yasir Shah took 2-59 for Pakistan. Earlier, leg-spinner Yasir Shah tore into the Sri Lankan top-order batting during the first session of the first Test at Abu Dhabi, becoming the fastest Pakistani to bag 150 Test wickets. With two wickets during the opening session, Shah broke Waqar Younis’ record to achieve the feat, slowing down Sri Lanka after Dinesh Chandimal won the toss and opted to bat first. 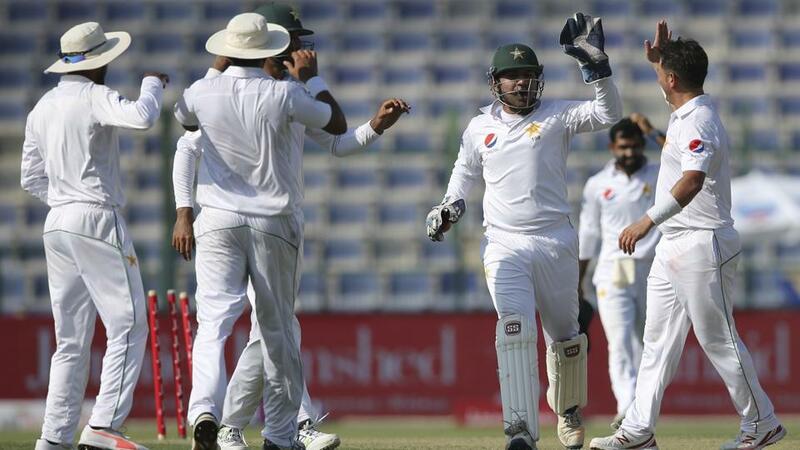 Middle-order batsman Haris Sohail is making his Test debut for Pakistan today, while the match is also Sarfraz Ahmed’s first Test as captain after Misbah’s retirement earlier this year. Playing without Younis and Misbah is unaccustomed territory for Pakistan, who haven’t had a Test featuring either of the talismanic, prolific pair in seven years. Speaking during the toss, Sarfraz said captaining Pakistan is a huge honour for him. The team has worked really hard over the past few weeks, he said. Fast-rising batsman Babar Azam at four and Haris Sohail will attempt to fill the void, while Azhar Ali and Asad Shafiq will also be expected to play a leading role. Azhar was in doubt for the first Test after suffering a knee injury but he has since responded well to treatment, while Yasir Shah will lead the spin attack in a squad with five fast bowlers. After the trophy unveiling, Sri Lankan captain Dinesh Chandimal expressed that his side has an advantage due to Misbah-ul-Haq and Younis Khan’s absence in Pakistan playing XI after their retirement. Chandimal accepted that the previous series of Sri Lanka was not good as it should be, but he expected that his team will regain its lost form.